HOW CAN A FUNGUS FLY BE A PROBLEM? 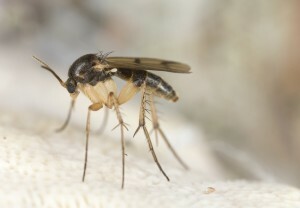 Fungus flies are a small fly which needs a lot of moisture to survive. Unlike other small flies which are able to live on most organic matter, fungus flies live on the fungus which is growing in moist and fertile soil, drain line sewage, crawl space algae or some other dark, well shaded moist medium around or inside a structure. These flies are about 1/16″ long and usually black in color. There is not much data available about their life cycle but it is known that they become adults in less than two weeks. It is also known that they need some kine of moist soil or other organic material on which to live and breed. No doubt household plants seem to be able to provide this environment but it could be down a drain line and insinkerators seem to be a favorite nest site. Such locations typically harbor a never ending water supply which allows fungus to grow which these flies require. In extreme cases, a leak from a water line or roof has lead to infestations. These flies naturally live outside and are attracted to light. Deck and patio lights will attract them to your home and once inside, they will nest where moisture and fungus is able to accumulate. There are many reasons why fungus flies can be a problem inside the home and out in the yard. Fungus flies are naturally drawn to mammals exhale breath because they’re readily attracted to CO2. That means these little flies can detect human breath which they think is something decomposing. So once in or around the home, fungus flies will find people and focus on our mouth, nose, eyes and other moist areas. And though they don’t bite, its annoying and no doubt disgusting. Fungus flies are easy to control. The use of PT-565 as a space spray will take care of any adults flying around the room you treat. Used like hair spray, it only takes 5-10 seconds of spray in any room and if there are fungus flies around, they’ll succumb to the treatment and die quickly. Expect to treat 2-3 times a day and focus on rooms with activity. In most situations, it will take 2-3 weeks to break the local cycle and eliminate the source whether you know where that is or not. For a more permanent solution, install AEROSOL MACHINES in any room with activity. One machine will cover up to 400 sq/ft and requires two double “AA” batteries to keep them running. Set them on shelves or mount them on walls at least 5-6 feet up. The machines will release a subtle 1 second treatment every 15 minutes thus insuring you have an active amount of pyrethrin in the air all the time. Each machine will need a CLEAR ZONE REFILL which should last 30 days. This can contains the same active as the PT-565 so it will readily kill fungus flies once treatments begin. Like using the PT-565, expect activity to be ongoing for 2 weeks but after that, the life cycle of nesting fungus flies should end so after a month, the problem should be gone. But in the future if they come back, you’ll only need to get refills since the machines are expected to last 5-10 years. If you have fungus flies active around plants, set out FUNGUS FLY TRAPS in their pots and around other areas where you have seen activity. These traps are easy to set out and their yellow color naturally draws fungus flies to their surface. 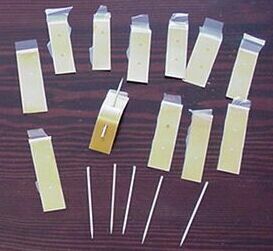 The glue will remain active for up to 90 days but replace sooner if they get full. Another trap which works great for fungus flies is the FLY WEB ELECTRIC TRAP. Install one in any room which has a problem and it will quickly start catching flying adults. In fact this trap will catch a wide range of flying pests including but not limited to fruit flies, gnats, flies, ladybugs, mosquitoes, biting midges, thrips, noseeums, fungus gnats, wasps and spiders. And you can set it well hidden behind an appliance or other furniture but target flies will still find it. Lastly, potted plants should be treated by watering them with an adulticide which can be safely added to your watering can. MULTIPURPOSE INSECT KILLER. is well suited for this job. 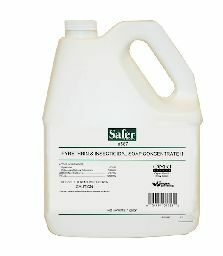 Its approved for organic gardening and treatments will last 2-4 weeks. We recommend adding 5 oz of concentrate to a gallon of water and use the mixture to water your plants at least once a month. Use it weekly until you see the fungus flies are gone. Since most fungus flies come in from outside, spray your plants and shrubs with CYONARA RTS. This product can treat up to 16,000 sq/ft per quart and is easy to operate. Just hook it to your garden hose and treat all turf, flower beds, shrubs, house siding and grass around the home. By controlling fungus flies on your homes exterior, you can keep them from entering the home altogether.